Cape Town, South Africa — The country of South Africa is a beautiful place and full of some amazing people, yet government corruption, politics and slow or non-existent police response have created a nation that is ripe with violent crime. It is so bad that every 25 minutes someone is murdered in South Africa, often for trivial reasons. A simple stroll down the street could get you mugged, and farmers located in isolated areas are often attacked or even raped by lawless criminal gangs. But the app is not only popular in South Africa but also in the United States where thousands of “cells” or groups of users have popped up throughout the country to organize users in decentralized units that allow for the crowdsourcing of safety. 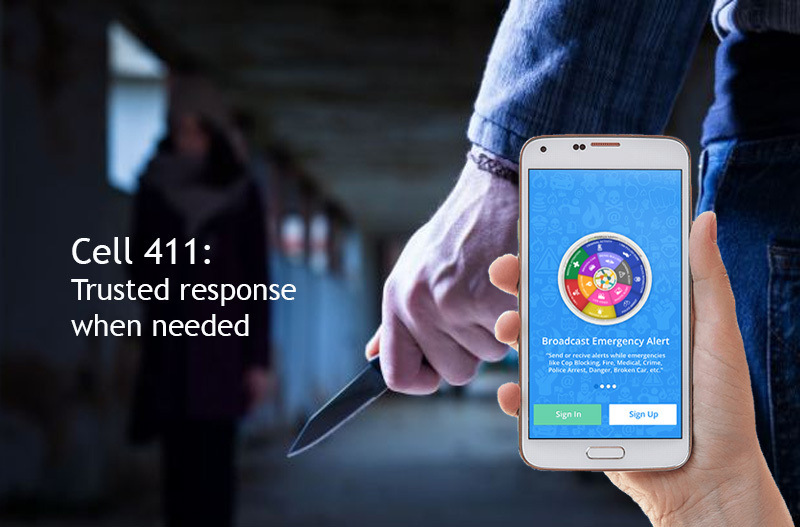 In essence, users can use the Cell 411 app to build networks of friends, families and neighbors to address emergencies without involving police or government services. A survey for the period 1990–2000 compiled by the United Nations Office on Drugs and Crime ranked South Africa second for assault and murder (by all means) per capita and first for rapes per capita in a data set of 60 countries. Total crime per capita was 10th out of the 60 countries in the dataset. Street violence has become the first choice for conflict resolution. The problem is seemingly insurmountable, yet a small mobile app called Cell 411 is empowering the South African public and helping them gain control of their personal safety without help from police or government employees. The mobile app, available both on Android and iOS, has become an overnight sensation in South Africa and has been downloaded by thousands of citizens who have been desperately looking for a way to establish a trusted way to receive help in case of emergencies. The app allows citizens to bypass calling police for help and instead build cells or groups of friends, neighbors and family members who can be instantly notified in case an emergency takes place. With the tap of a finger, the user can summon help from 1, 2 or 200 trusted friends, neighbors or relatives. The exact coordinates of the incident are instantly sent out to his friends, with directions to the location of the incident. The user can even stream live video of an incident in case evidence is needed for a criminal case. Neighborhood watchers, police accountability activists and other community members throughout the United States use Cell 411 to provide better safety for their communities. The app is being used to stream live video that cannot be erased by police and keep both criminals and police accountable for their actions. South African farmers use Cell 411 to track down cut fences, tag the location with exact GPS coordinates and organize with other farmers in decentralized, independent groups to provide mutual aid and security in the farming community. Neighborhood watchers all over Johannesburg are using the app to keep their neighborhoods safer and even owners of security firms are using it to dispatch help and security guards to their clients. The app is now listed at #15 in the top most popular social networking iPhone apps in South Africa. In addition to its world-wide popularity, in March 2016 the U.S.-based Cell 411 has received an initial angel investment of $200,000 which gives the team enough operating capital for 2016, allowing them to develop and release version 3 of the app in the summer of 2016.